Bay Area multimedia artist Linda Gass was the first artist to participate in the new Creative Ecology artists residency program at the Cooley Landing in East Palo Alto. The program brings together art, science, open-space environment and educators. 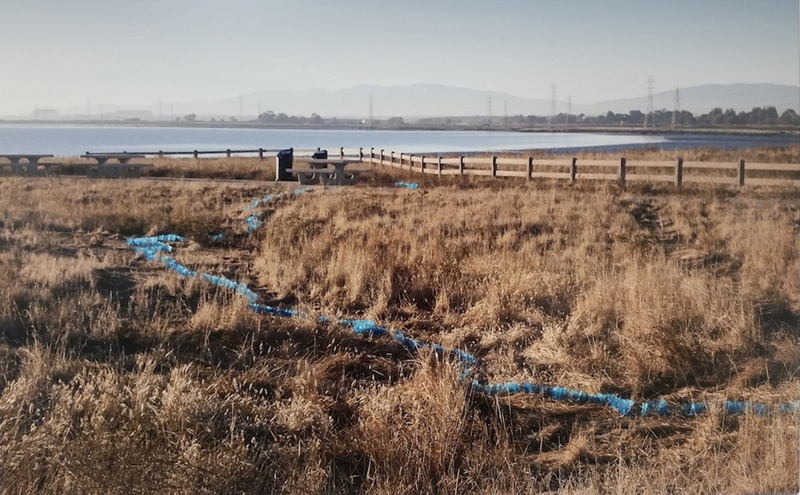 In a series of photographs, Linda brings to the Palo Alto Art Center images of her temporary land-art installation at the South San Francisco Bay. 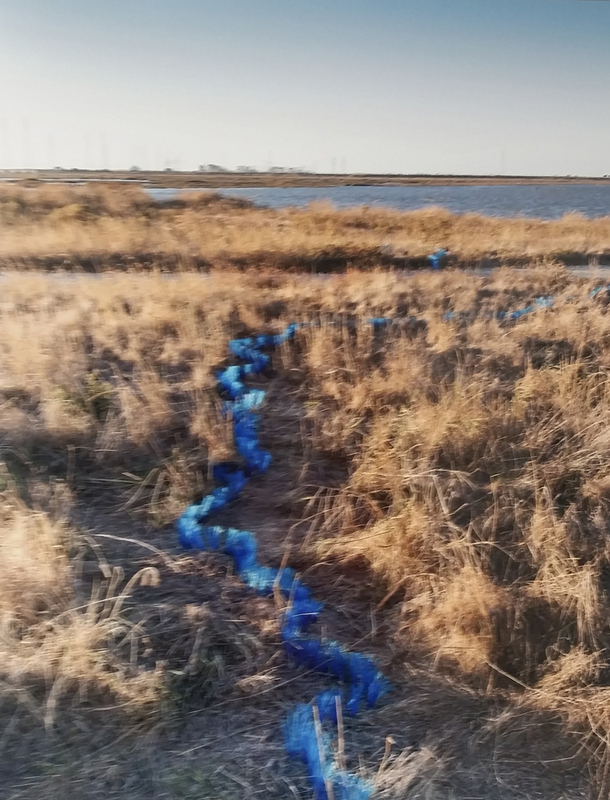 With the help of members of the community, she marks the original coastline of the landing with blue bands of synthetic material, defining a large area between it and the current coastline. 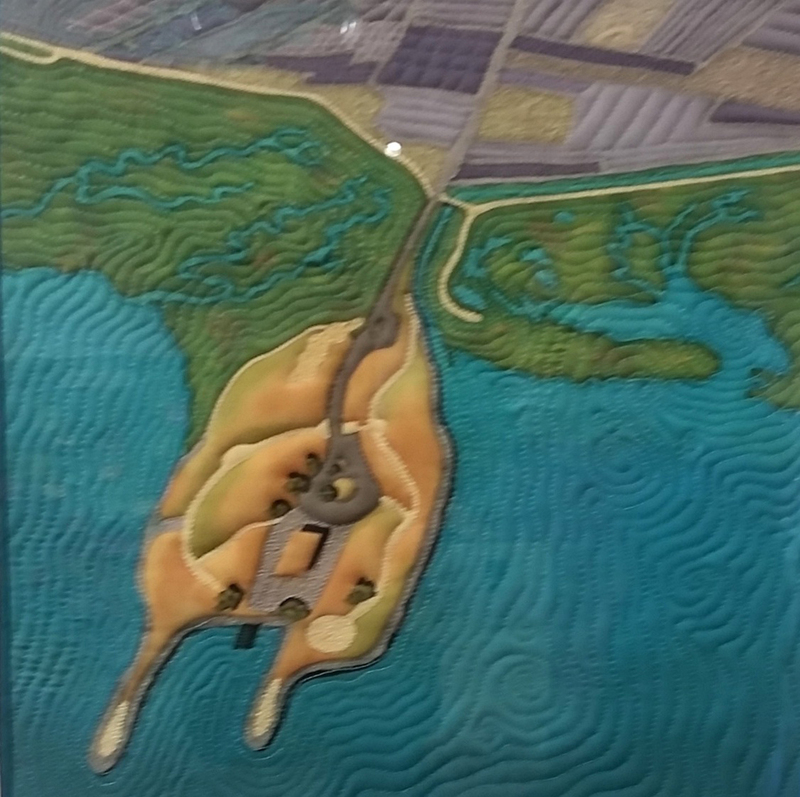 The work delineates the expanded area that was formed in the mid- 20th century by the land-filling from the San Mateo waste dump. The long plastic bands stretch through the vegetation, forming an aesthetic abstract shape in the surrounding landscape. In her installation, Gass continues a long land art tradition, creating a contemporary synthesis between the artificial land enveloping of Christos’ islands and the natural landmarks that Goldsworthy arranges in his native landscape. The artist clarifies the temporary nature of the installation in a careful signage, which redirects our reaction to the foreign texture of the blue plastic in the middle of nature. As a result, instead a menacing message of pollution, the synthetic material blends with the environment and becomes part of the intended message, telling a story of a place that used to be a dump-site. Gass narrates her imagery with the happy ending of the shoreline landscape that was recently restored via land capping efforts into a renewed fresh soil with a reborn eco system of lush plants and a striving bird and fish populations. But Gass does not let her audience enjoy the small victory of nature. 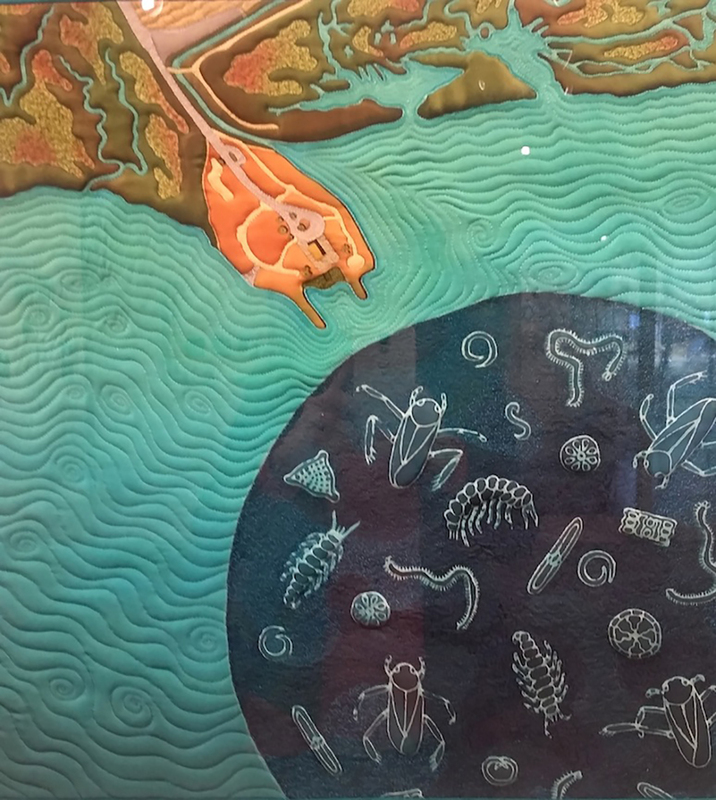 Instead, she issues an ecological warning in her series of stitched silk paintings, describing how the Cooley Land is soon to disappear again under the predicted rise in sea level. Placing these fabric paintings besides her photographs of the community celebrating an environmental victory, Gass warns us on the larger ecological hazards that are threatening this strip of revitalized land. The soothing home quilting harmonies of the cyan works give the misleading sense of paradisiacal calmness and the mistaken sense of safety of a home, only to discover that they describe the devastating stages of the future disappearance of the land and its vegetation. Linda Gass’s exhibition at the Palo Alto Art Center raises an important aspect of art activism that adds to the work its multidisciplinary significance. The show summarizes her recent residency at the Center where she devised a hands-on demonstration to the community of the fragile nature of the San Francisco Bay. Along with the apparent pleasure of silk painting practice, Gass is devoted to environmental cause and harnesses her work to the message of the sometime forgotten dangers to our surroundings. Cooley Landing is now on view at the Palo Alto Art Center till January 22, 2016. The exhibition is part of Creative Ecology, a new artists-in-residence program. It is a collaboration between the Palo Alto Art Center and the Palo Alto Junior Museum and Zoo.